Fluorescent and incandescent lighting in one convenient unit. Independant rocker switches enable you to operate the lights independantly or together. Spring-balanced swing arm features spring covers and a generous 45" reach. Large comfortable thumb knobs make it easy to adjust arm and shade angle. The 10" diameter heavy duty metal shade has a stay cool handle for easy positioning. All metal construction with 3-prong grounded power cord, electronic ballast and heavy duty mounting clamp. Takes one energy saving T5 28W circular fluorescent bulb(included) and one 100W maximum incandesent bulb (not included). UL listed. Available in Black or White. 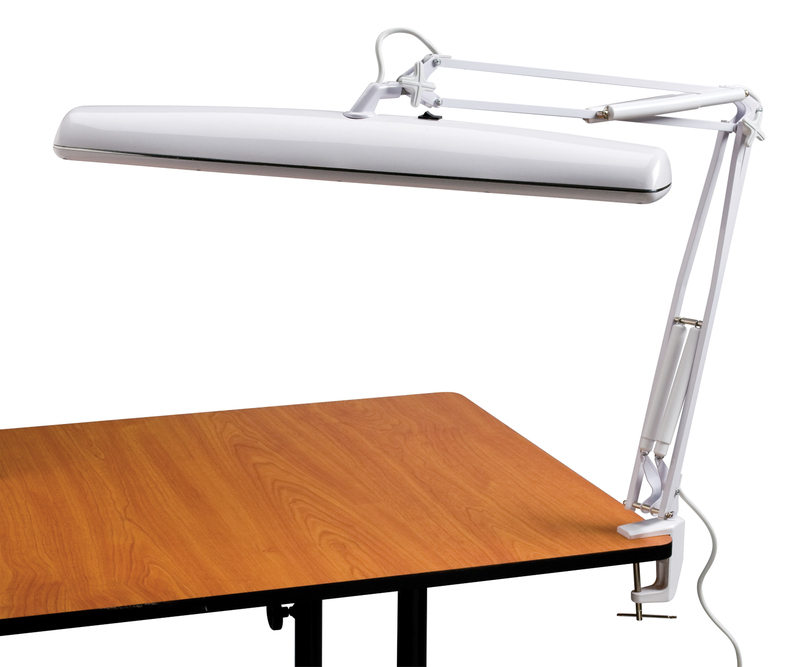 This office and drafting lamp features three fluorescent bulbs for a total of 42w with a unique rectangular gridded shade to evenly spread light onto the work surface. Features heavy-duty desktop mounting clamp that fits up to 2 1/2" thick surfaces and electronic ballast. Includes 3 - T5 14w fluorescent bulbs. UL listed. 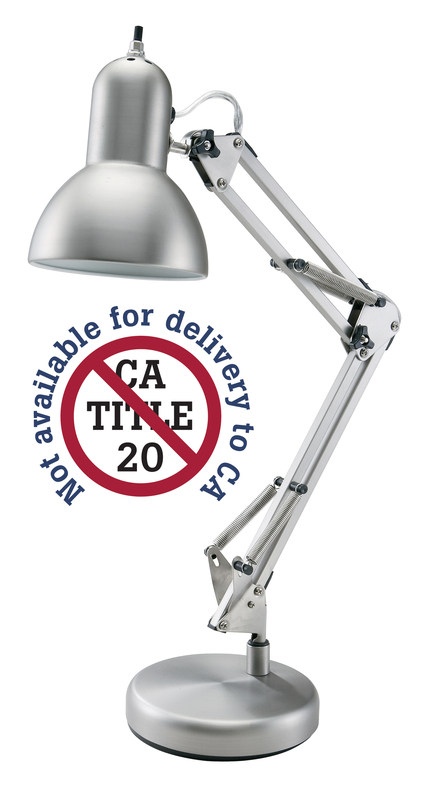 Ideal for office and drafting environments, this extremely versatile and reliable task light features all metal construction and a heavy duty desktop mounting clamp that fits up to 2 1/2" thick surfaces. The 38" reach extension arm offers a wide range of positioning options. The 18" x 4 1/2" heavy duty rectangular metal shade is fully adjustable using the convenient thumb knob. Takes two - 15 watt fluorescent tubes (both included). 3-prong grounded power cord. UL listed. 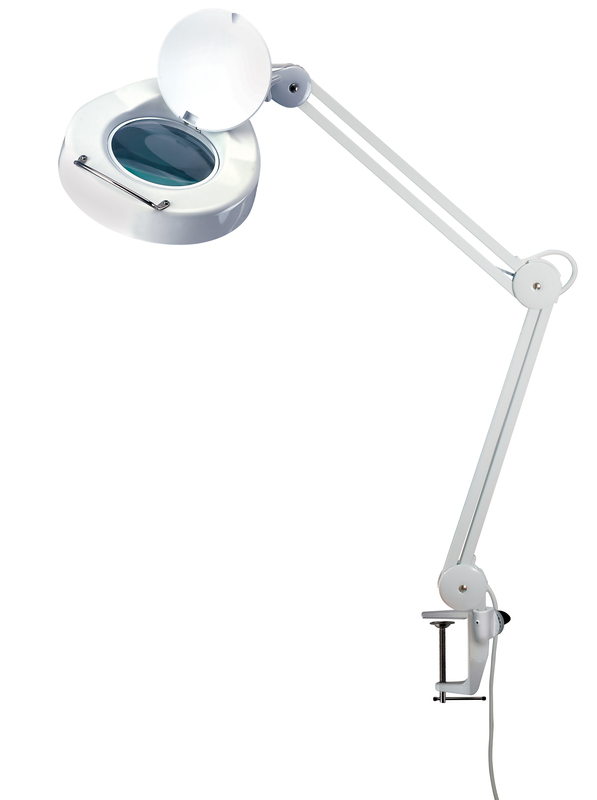 Professional, low heat magnifying lamp with high quality, extra large 5" diameter lens features a fully adjustable internal spring arm with a 45" reach. Convenient stay cool handle on head for positioning a 3-diopter glass lens provides 1.75 times magnification. Removeable protective lens cover makes this magnifier lamp useable as a table lamp. Takes one T5 22w daylight simulation bulb (included). 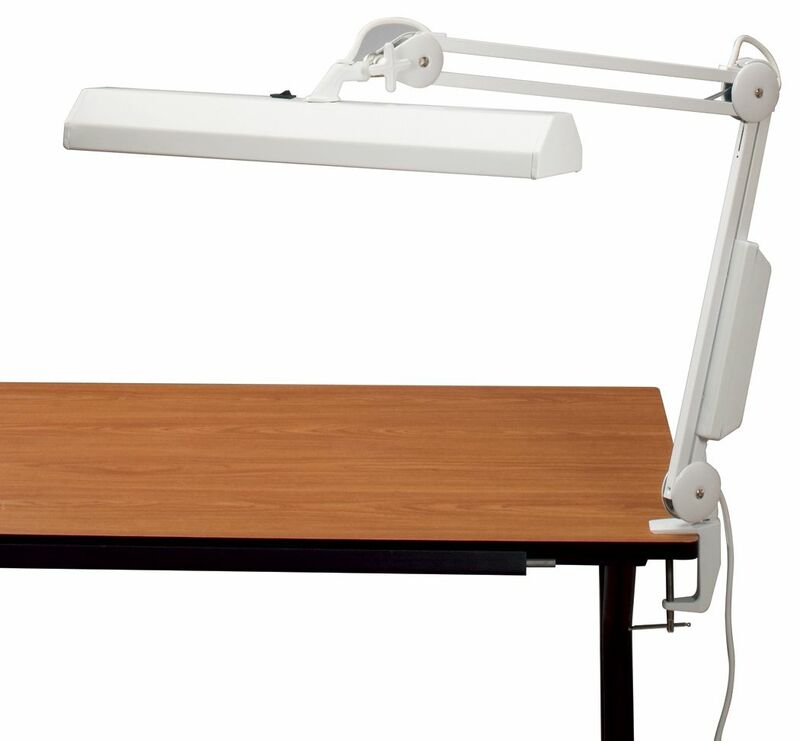 Includes heavy duty desktop mounting clamp that fits up to 2 1/2" thick surfaces. All metal construction. UL listed. 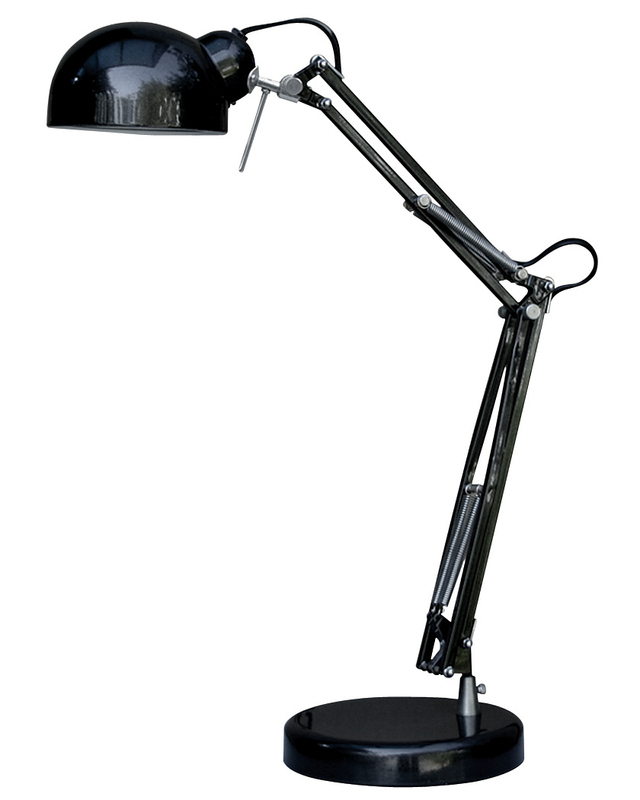 ENERGY STAR rated energy saving lamp features a high gloss 4 3/4" dia. shade, spring controlled balance arm. 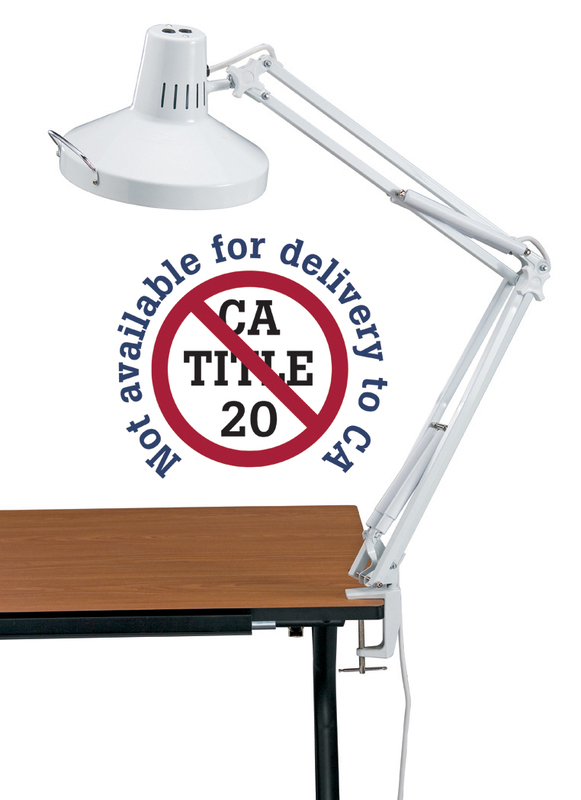 13w fluorescent bulb, and space-saving 14" arm reach. This outstanding light source includes a 10" diameter aluminum reflector that swivels to any angle with it's wooden handle, and accepts a 75watt household bulb. It's 3-section telescopic stand adjusts to 7ft. high and weighs just 4lbs. The 8ft. cord plugs into any outlet.